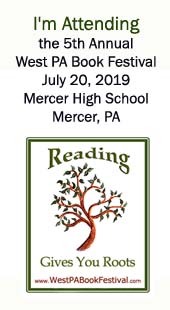 If you're an author, published or not, in the far western Pennsylvania area (roughly between Erie, Oil City, and Pittsburgh, you can sign up for our newsletter where we share information about local happenings and opportunities for book signings, including the annual Book Festival in July. This is an authors only newsletter. Readers can follow our public blog to find events by our authors. If you're trying to reach us, please use our contact email: staff@westpabookfestival.com. Replies to the newsletter may not get through. To sign up, fill in the following form and make sure to confirm your subscription when it reaches your email! Check your trash bin if you don't get it right away.